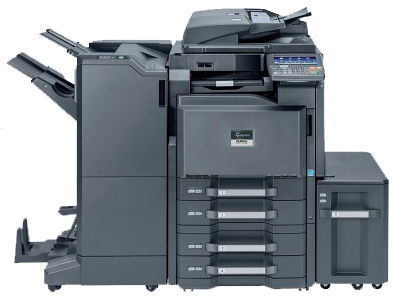 The Kyocera KM 3050 is geared towards mid sized offices with a monthly volume estimated at 100,000 impressions. Easily complete day-to-day projects with the basic capability of copying, printing, and scanning. The standard network connection allows users all over the office to utilize all the functions that the KM-3050 offers. Productivity remains consistent with the first print out time of 3.9 seconds and letter size documents being delivered at 30 ppm. work group. Simple to operate, it takes your document handling capabilities to a new level.Standard paper handling features on the KM-3050 include the 200 sheet bypass tray and the dual 500 sheet paper drawer. The automatic duplexing allows offices to condense projects from single-sided to double-side saving paper. The KM-3050 also allows users to print PDF files directly from a USB drive through the slot located next to the control panel. The robust toner yield on the KM-3050 produces more projects before it will need replacing. The KM-3050 black toner cartridge has an estimated yield of 34,000 pages (6% page coverage). Well laid-out controls and a colour LCD on the colour touch-panel ensure operation is simplicity itself.